Our sukkah is up. This holiday, the Jewish festival of Sukkot, was one of my favorite Jewish holidays. 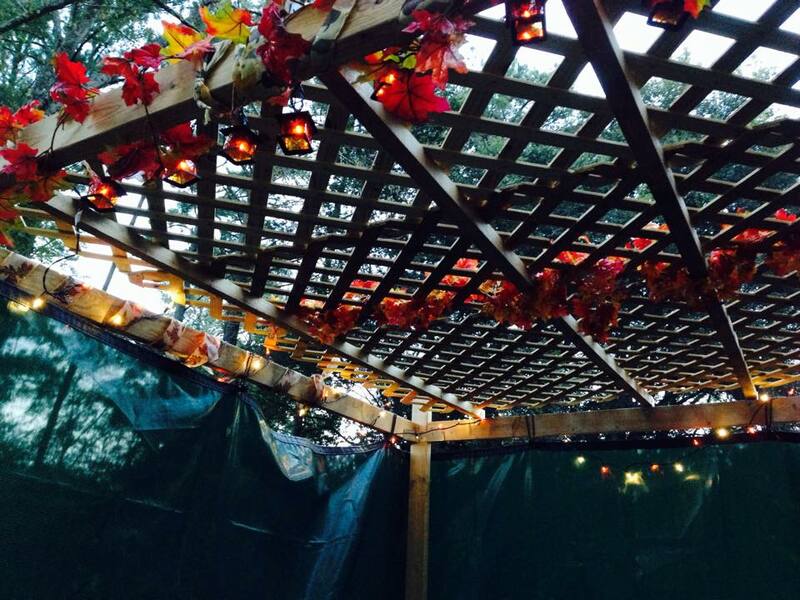 Decorating the sukkah, welcoming the autumn leaves, sitting with my family sharing meals as we looked up at the sky. Sukkot, so colorful & festive, the only Jewish holiday where we are commanded to rejoice. The sukkah is up, and I can’t bring myself to sit in it. Here is the thing. Five months after my father’s suicide, I need no metaphors for the fragile and fleeting nature of life. I am living with that notion each and every day. It is palpable, it is raw, it lies just beneath the surface. I wear it, like a layer of clothing that no one can see, and only I can feel. I don’t want to sit in a structure that further reminds me of what I know all too well. And then there is the word, “disappear.” It’s quite something how loaded and burdensome language can become in the aftermath of suicide loss. You see, on a Sunday I had a father. He was struggling, he was lost, he was not the man he wanted to be. But he was fighting. He was here. We thought he still had hope. On a Monday morning, everything changed, and he was gone. He was just gone. There was no note, there was no goodbye. And so much of the time it feels like he just… disappeared. The structure & the symbolism of the sukkah, are physical reminders of what is no more. He was here, then he was not. Life, fragile and fleeting, the end that awaits all of us, fated to disappear… I simply can’t enter it. It is like having those words wrap themselves around me, anchoring me to a pain that I seek respite from. Come in and dwell, the structure beckons, be both commanded to rejoice and reminded of what is at the very heart of your grief & your pain. The sukkah, if it is to be kosher, cannot have a closed roof. We must be able to see the stars, they are the reminder of God’s eternal presence. But as I shared on my post about the High Holy Days, I am struggling with God. I am grappling with my own anger, but it is more than that. I am struggling with the idea of where my father is now. Where is his soul? I want to be able to envision him somewhere. I want to close my eyes and see him somewhere he is whole, smiling, feeling safe and loved. I know he is with God. But I don’t know what I think that looks like. I am struggling to piece together what I believe. I envy those faiths that have such vivid imagery about what heaven is like. I want that. I want to envision God’s loving embrace surrounding and holding my father close. I hope I will find that image, that notion, that comforting idea in time. But for now, I can’t. I can picture him only in his final minutes of despair and hopelessness, in his coffin and in a grave. My mind, clouded by trauma, cannot access the happier memories, the sound of his laughter, the comfort of his embrace, even the struggles that we endured along the way. I can’t access the essence of my father, the complex man that I loved. The man with whom I shared great joys and abundant sorrows. The man with whom I traveled a road that was not always easy, far from it at times. We had incredible highs and heartbreaking lows, we hurt one another, and we healed. We lost one another and then found each other again. He was my father. I was his daughter. In time, we grew to be friends. When he left, we were closer than we had ever been. I loved him. He loved me. And yet, I cannot access any of it. I look at the stars and search for something that will give me peace. I haven’t found it yet. I’ll keep searching. I have to. But in the meantime, the sukkah stands decorated and open. And this year, I will not step inside of it. I hope that next year, and in the years to come, I will once again find the joy I have felt for this holiday. That I will not need to be commanded to rejoice, it will simply be a reflection of what I truly feel. But right now, in this place, at this time… it is not. So I stand on the outside of the sukkah looking in. I looked up the word fragile. When describing an object, it means easily broken or damaged. When describing a person, it means not strong or sturdy; delicate and vulnerable. The sukkah is the object. The person is my father. One I can’t bring myself to step into. The other I’d give anything to bring back.